Do you feel something is wrong with the United States and the global economy? Despite a respectable recovery and low unemployment, many people aren’t happy with their current economic situation or their outlook for the future. From rising prices for basic necessities or schooling, to harsh competition and low pay for lower income jobs, to negative interest rates—the poor and the middle class all have their problems to deal with. Experts in the government and central banks are trying to manage a suboptimal situation but cannot isolate the problem, let alone offer solutions. Or maybe they know what’s wrong but don’t want to talk about it because the truth is too shocking. Enter Viktor Shvets, the global strategist of the investment bank Macquarie Group. He not only dares to think outside the box but also isn’t afraid to openly voice his opinions, which are fascinating and shocking at the same time. “The private sector will never recover, it will never multiply money again,” he told Epoch Times. His main theme is the “declining return on humans,” which means that in today’s digital world, normal humans don’t grow productivity fast enough to justify more jobs and higher wages as the machines are taking over. It takes time to line up machines, and this time we are replacing humans altogether. “There is no productivity on a global basis. Secular stagnation, technological shifts, monetary policy, all are suppressing productivity growth rates,” he said. But what about technology making humans more productive? Shvets says this was true in the first and second industrial revolution, when displaced jobs, such as the horse-cart driver, eventually morphed into higher-tech and higher-productivity ones, like the taxi driver. 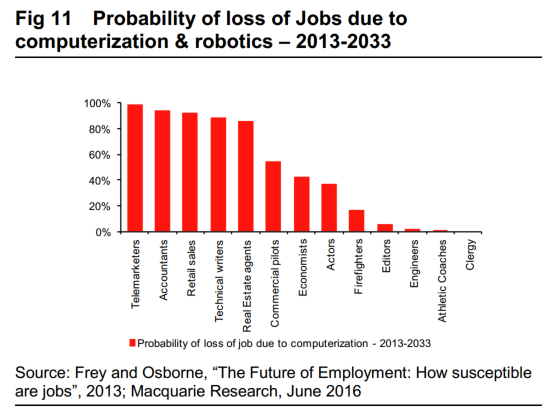 However, in this, the third industrial revolution, machines are not augmenting humans, they are replacing them. The self-driving car will completely eliminate the driver. And even in the previous, more-mechanical industrial revolutions, it often took decades for productivity growth to recover and for jobs to come back, and only after higher-productivity sectors dominated the majority of the economy. “We are now on the sharp end of the technology S curve. It started in the late 1970s, it’s picked up in the last 5 to 10 years, productivity growth rates go down, not up. It takes time to line up machines, and this time we are replacing humans altogether,” he said. And not only lower-skilled jobs like taxi drivers are threatened. Just look at the floor of the New York Stock Exchange, where you can barely see a human specialist trader anymore. The machines in New Jersey have taken over the trading. Of course, there are companies and sectors in which machines augment people’s productivity, but they are in the minority and also always teeter on the edge of machines replacing humans completely. “Parts of the economy become extremely competitive, the rest becomes far less competitive. Walmart’s two million employees are less productive than the few hundred thousand people working for Amazon,” said Shvets. Walmart’s revenue per employee was $220,000 at the end of the second quarter of 2016, compared to $1 million per employee at Amazon. As a result, total productivity growth has been negative in the United States for at least a decade, according to the Federal Reserve Board of San Francisco. The so-called Total Factor Productivity fell almost 2 percent annualized in the second quarter of 2016. In order to counter falling productivity, households and companies, as well as the government, have taken on unsustainable amounts of debt to keep consumption going. “When the economists say we can continue to leverage, as we have done in the last three decades, it lacks understanding of the balance sheet. Even at zero interest rates, at a certain level of debt, you go bankrupt because the private sector loses confidence in the system,” said Shvets. This is the phenomenon of a balance-sheet recession, where the whole balance sheet of the economy must shrink in order to restore confidence in the system and return to private-sector business cycles. Japan is the most famous case; its balance-sheet recession is now 25 years old. But the United States and Europe essentially have the same problem. Since the beginning of 1980, total debt in the United States has increased by a factor of 14 to $63.5 trillion, while GDP has only increased by a factor of 6.2. The debt is not spread evenly, we still live in a tribal world, and it’s easier to start a war than to forgive debt. Shvets says the world should have actually delevered or paid down the debt to return initiative to the private sector, but thinks people could not accept the levels of pain associated with doing that. 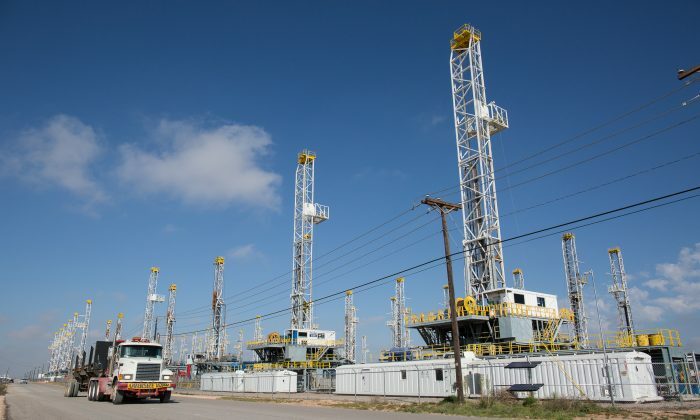 “You could eliminate the impact of the overcapacity through deflation. Nobody is prepared to accept that we might have to wipe out decades of growth just to eliminate leverage. Banks go, there are defaults, bankruptcies, layoffs,” he said. He thinks the biblical debt jubilee, when slaves would be freed and debt would be forgiven every 50 years, is a nice idea that would also work today if it weren’t for entrenched special interests. Global central banks, with their easy money policies of negative interest rates and quantitative easing, are working against a debt deflation scenario, with limited success, according to Shvets. Both overleveraging, easy-money policies and technological shifts are responsible for increasing levels of income inequality across the globe—another hallmark of the previous two industrial revolutions. Fewer people control more of the wealth. According to the World Bank, the U.S. GINI coefficient, which measures inequality, rose from 37.7 in 1986 to 41.1 in 2013. In China, it rose from 27.7 in 1984 to 42.1 in 2010. The higher the coefficient, the higher the concentration of income among a group of people. So if the private sector won’t recover until most of the debt gets written off, which won’t happen because neither the people nor the elite want it to happen, who is left to pick up the slack? “Nobody has visibility; private sector signals have died. The private sector has no idea what to do. The more aggressive the public sector becomes, the less visibility the private sector has. They don’t spend and invest the way they should,” said Shvets. According to him, the state will take over—it’s only a question of how. If you are dominated by the public sector, then investment in the traditional sense is no longer possible. This move toward the state brings its own issues, however. Business-cycle theory centers around the expansion and contraction of money and credit, as well as business activity, earnings, and stock valuations. If money and credit are abundant, businesses invest, expand, and hire people; consumption picks up, so company profits improve. Stocks tend to rise in tandem with an expansionary cycle. This is not true for the state; public investment in infrastructure and central banks printing money create a super cycle, with a huge bust at the end. The S&P 500 is trading at an all-time high despite the second most expensive valuations since the 1999 stock market bubble and despite the fact that total S&P 500 earnings fell during every reporting period since the third quarter of 2015. The market is banking on the Fed to turn on the money spigot again, at any time. “The public cycle is aligned with politics. People always avoid radical solutions, so they are doing a little bit here, a little bit there, to keep the Humpty Dumpty on the wall,” said Shvets. Eventually, if the private sector doesn’t recover and the state assumes more power, Shvets thinks countries will move toward fascism and communism again, just like in the 1920s and 1930s, when the economic framework was comparable to today’s. “Younger people like communism because it is inclusive, paints a bright picture of the future. Nobody believes it, but it looks good and young people don’t have anything to lose. Older people tend to be more racist, less inclusive, protectionist, anti-immigration, rather than believe the bright future of everyone holding hands together in a sunny place,” said Shvets. Either way, the outcome could be similar to what took place in the 1930s in Europe and the United States—less globalization and more power to the state. Nevertheless, there are some government programs that Shvets thinks could enhance human productivity and benefit the private sector, like government research and development (think of NASA in the 1960s), as well as re-skilling and retraining programs that would enable workers to compete with machines. In the long-term, Shvets thinks that biotechnology could play a role in that process, but we are a long way off. This means we can conveniently forget about corporate profits, or valuations like the price-earnings ratio of the S&P 500, as many investors already have. The only thing that matters is public sector activity in the form of central bank intervention or government stimulus programs. If that is the case, gold goes back $100 per ounce. An extreme example of this cycle is perhaps Venezuela. While the country is going up in flames, people don’t have enough food, and the currency is dissolving itself in a vicious hyperinflation, the stock market has actually gone up 10 times since the beginning of 2012. Only recently has reality caught up with stocks, and the market has given up 15 percent of its gains since the beginning of the year. “Buy quality sustainable growth, high returns on equity. Companies capable of generating a high return on equity through margins and without leverage. Don’t worry about the price-to-earnings ratio, there is no mean reversion,” said Shvets. “And don’t own any financials.” Good advice. The stock price of the likes of Deutsche Bank and Credit Suisse have been decimated this year. 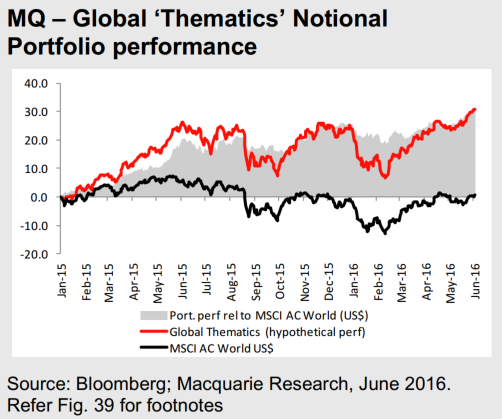 None of the new trends can be described as inspirational or uplifting, but the Macquarie portfolio reflecting the themes has bested the MSCI World Index by almost 30 percent since the beginning of 2015. “The biggest theme is declining return on humans; the replacement of humans; biotech; augmentation of humans; opium for the people, like computer games and gambling,” Shvets said. Then there are themes catering to geopolitical risk and potential regional wars or civil uprisings, like detention and prison centers, weapons, and drones. Another theme supports the aging demography in the West, so companies holding hospitals, funeral operators, and psychiatric institutions should do well. If readers shy away from profiting from these themes, there is always gold. What Is Going On With US Stocks?